Do you want to have a useful and ergonomic lamp for your work table or your bedside table? Aside from a lamp’s lighting benefit, it is also a good way of designing your table or your space to make it feel more vibrant and homey. This piece of furniture will bring more life and light to a boring and badly lit area. So what are touch lamps? Unlike a regular lamp, touch lamps can be switched on and off with just a touch of your hand. This awesome feature is perfect for people who love innovations that will make life easier for everyone. These lamps are also more stylish and it can fit your interior really well. You’ll have a lot of styles to choose from that can accentuate your room’s design. A touch lamp is especially useful for your bedside table. The materials used in a touch lamp are usually ceramic, glass, aluminum plastic or steel. It is important that a touch lamp’s material suits your style and your room’s theme. If you’re already too sleepy to get up and turn off the lights, a touch lamp will give you the easiest way of putting out the lights. No more fiddling with switches because it is already touch sensitive and will respond to your touch immediately. If you want a touch lamp that will charm your visitors when they see it, a cute and elegant looking lamp is the one for you. It will not just give warmth to your space but also make it more stylish. Getting this kind of touch lamp will take your room’s design to a whole new level. A Dimmable LED Vase Table Lamp Touch Control is an exciting piece of lighting that can be placed anywhere in your home. It is a touch lamp that can be used as a flower vase or a pen holder. This lamp is not just cute and elegant but is also very useful if you put it in your study or working table. Having a multipurpose lamp like this one will greatly help you with your needs. This LED vase touch lamp can be used to make your flowers fresh as well. Put water in it and place the LED vase in your baby’s room or your living room to make everything feel lively. It also has 7 brightness levels that you can use depending on your taste. You can dim the lights when you put the baby to sleep or even for your own sleeping preference with just a touch of your hand. This lamp is easy to use because it is rechargeable and can be connected to a laptop or computer by using a USB cable. It’s a good lamp that is both well-designed and useful at the same time. For a more intimate atmosphere in your room, you can choose a touch lamp that is simple but has a classic design to it. If you don’t want a lamp that pops out you can get a Revel Lucerna 13″ Touch Bedside Table Lamp. This lamp doesn’t look like something out of the ordinary but it is eco-friendly and will give you the lighting that you need in your bed side table. This lamp’s base will quickly respond to your touch and give you warm lighting to give a peaceful and cozy ambience. It can accommodate LED, CFL, or any traditional 60 watt bulbs if you need to change it someday. The honey beige color of this lamp will give the room a nice glow. And although the base looks like it is made of a wood material, it is actually metal which is great if you need a lamp that will blend in your wooden furniture so it doesn’t look out of place at all. Honey Beige Lamp provides a warm glow and would be a perfect addition to any bedroom night stand or living room. This lamp absolutely worth its price! This lamp fits the exact purpose to light up a corner of the living room where a full sized table lamp would not work. If you want a touch lamp in your small study table, a nice small atmosphere lamp is perfect for you. Having a petite touch lamp will make it easier for you to do your tasks without a lamp that is taking too much space. Haysom Interiors boasts of the Ice Cube Glass Table Lamp with 4 stage dimmable settings and a chrome base. It is an amazing compact touch lamp that you can put anywhere without worrying too much about the space that it will take up. It has a modern look to it that can add a sophisticated feel to your table. This Ice Cube designed touch lamp has a 4 stage touch that can help you dim the lighting. Whether you want it to be low, medium, bright, or turned off. It’s very efficient to use and will help you with your tasks a lot. Touch lamps are very user-friendly and will give you the lighting that your room needs. Choosing which one is the best will rely on how you want to use it or where you want to place it in your house. Touch lamps are very helpful and will give your space a touch of elegance as well. 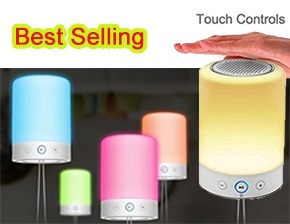 Touch control lamps have entered the market with great fervor because people are always looking for something that is unique and modern. These are lamps straight out of the future and something you’re going to have your eyes on when you get a peek for the first time. Here is more on what these lamps have to offer those who are interested. The automated features that come with a touch control lamp are hard to deny and one of the key reasons people mention when it comes to the allure of this product. You will feel it right away, and that automation is breathtaking. You are getting something unique, and the basic lamp is not able to meet to your standards as this does. Most people are attracted to technology that is unique and has a bit of modernization to it that is hard to find in other products. These do stand out for all the right reasons. What isn’t fun about getting a lamp that is touch-based? You are going to get something that is beautiful from all angles, and that is why people love it so much. You are going to be blown away by it in the end, and that is what people adore. The reason most people are attracted to this lamp has a lot to do with the beauty it emits when you first take a glance at it. You will be mesmerized, and it is love at first sight, to say the least. If you are looking for the perfect desk lamp for reading, then look no further than the Fugetek FT-L798. It’s short, simple, affordable, and has enough features to make even the pickiest of buyers happy. The 14 Watts LED bulbs used for this lamp have a lifespan of 25 years given regular use. Leaving the light on 24/7 will undoubtedly cut that lifespan down dramatically. There are quite a few different lighting options available. Offers 4 different lighting modes & 5 levels of brightness, with touch sensitive dimmer for different lighting needs. That’s the same amount of lighting options as the Vont lamp, but the lamp from Fugetek has a few extra features you might prefer. 15″ high modern simple design in great looking. The lamp can be used anywhere space with quality light. It can fold and put away for easy storage. The first tip when you are buying a lamp such as this is to make sure you know where it is going to be used. Are you going to be putting it in your living room? Will you be putting it in your bedroom? Think about this, so you buy the right lamp. When it comes to the looks of the lamp, you will have to mull over this as soon as you get the chance. You want to think about the atmosphere this lamp creates and how it will decorate your room. Remember, this is a big part of the room and will play a role in the aura it has. You need to think about how the response is from these touch controls. If the response isn’t good, how are you going to stay happy? It won’t work out at all, and that is a real worry for most people. You should always look to compare options because that is the only way you are going to find the ultimate touch lamp for your needs. Don’t think any touch control lamp is going to suffice because it won’t, and you will end up wasting money on something that is unhelpful. When L7 bedside lamp power on, a simple tap to switch brightness and soft color on top mesh. easy and convenient in dark environment. Soft white soft lighting led table lamp, protect your eyes from harming. Bluetooth 2.1 smart portable lamp, compatible with most digital devices with bluetooth. The red light is amazing for sleeping because it filters out the blues, doesn’t keep you awake and works great as a nightlight so you don’t trip when you get up in the middle of the night to go to the bathroom. This little speaker makes some of its bigger competitors look weak! I highly recommend purchasing this if you are looking for a good quality Bluetooth speaker. Highly recommend for kids room! This Youkoyi F9 is a perfect lighting for reading. Really liked the choices of variable light levels. It is very lightweight, so do use caution as to where it’s placed so it doesn’t get knocked over. Remote Control and Touch Switch – Use the touch control to switch on/off the light, and adjust different brightness and color temperatures with the full 360 degree remote control. Memory Function and Night light Setting – It will save the mode you set, no more trouble to switch back to your desired level. This lamp also have a sleep time setting and night light mode, let you have a tight sleep. The different color Temps work out great, the dimmable light also great, the timer is a nice feature as well as the remote would recommend to anyone and may buy again, simple to put together and sturdy. This is a very soft light, but not going to brighten a room. If you keep it on high, bright and are directly under it you can read but don’t try to get to far from it. These are the things you have to hone in on when you are making a choice. You don’t want to end up with a touch control lamp that is going to waste time and won’t have real value to add to your property or life. Think about these things in advance, so you end up with a solution that is worthwhile. Remember, not all touch control lamps are made equal, so you are going to have to do your due diligence in this regard before a good purchase can be made. When you do this research, you will be a happy person with a great new touch control lamp in hand.